I wrote recently about how some museums are using technology to extend their relationships with constituents beyond the space and time of a visit. This is a strategy in service of a bigger goal, which has to do with positioning the museum as an ongoing resource for its audience – not just a place to go but a trusted advisor, friend, and information base. This is a big strategic idea, and one that holds a lot of appeal. On the one hand, it differentiates museums from the leisure time activities we often think of as their natural competition – city parks and playgrounds, the movies, music lessons, computer games, play groups etc. On the other, it differentiates museums from out of school time and social service organizations like the YMCA and Boys and Girls Clubs. This is not a new idea – The Boston Children’s Museum has always spent a lot of time and care on community relationships. Take for example programs like Countdown to Kindergarten which is as much about creating an activity for local families to celebrate a major life transition (kindgergarten), as it is about weaving the Museum into the fabric of the learning community (see their success in bringing the Mayor and Superintendent of Schools together, literally). BCM is actually a good segue for what I’m thinking about which is that adults are one of the key audiences for these on-going relationships with Children's Museums in particular. As a field we increasingly understand that there are good reasons to move adults to more involved roles with their kids. Research has shown that adult participation leads to deeper inquiry and more durable learning for children, while at the same time enhancing adults’ understanding of and ability to support children’s informal science learning. But let’s be honest - adults come to museums for many reasons, including taking a break and socializing with peers, and have their own learning styles. So I am really intrigued by the idea that museums can develop umbrella relationships with adults in which the moment of the visit is one touch point among many opportunities to engage with the organization. This might give us more room to allow that the visit may not always be the best moment to reach adults, but it also suggests that that’s okay because we have many more opportunities to connect with those adults. We don’t have to pack it all into 2 hours on a Saturday. How about these as goals for adults? The key to achieving these goals is to increase adults’ understanding of the museum as about learning. To do this, museums need to accomplish three main things (1) make children’s learning evident, (2) offer adults opportunities to participate in children’s learning, and (3) give adults tools they can use to enhance children’s learning. Some of these may lend themselves more to implementation in the exhibits but all of them can happen off-site as well. What should parent communications sound and look like? Parent message need to be a mix of didactic, intimate and informal communications. Some parent communication will be explicit for adults who are interested in learning why the museum looks the way it does, and what their kids are getting out of the visit. These “decoders” may take the form of maps, labels and graphics in the galleries, “parent guides” and questionnaires, or verbal communication through staff interaction. Other communication is more discursive and needs to be structured so that adults can make connections between the messages and their children’s behavior. Here are 3 examples of how this might translate into graphics. Staff at MCM carry these cards. Pittsburgh Children's Museum projected graphics are in adults' immediate line of sight and provide a quick prompt. An "exemplar" graphic from Skyline at CCM features photos of real visitors and first person quotes - the graphics stand in for staff by modeling adult roles in the gallery. These three examples of actual printed graphics get at some of the key strategies for adult communications during the museum visit. They are designed to help adults see what their kids are doing and learning. And they offer interpretation and explanation of the Museum's philosophy and intentions. Engage adults in collaborative work with their children and offer multiple possible roles for adults throughout the museum so that sometimes they are leading and other times they are supporting the primary inquiry. Train staff to articulate children’s learning to model interactions that support the expression of learning. Train staff to recognize adult learning in the museum setting and in how to support adults in gaining confidence and skill as partners in their children’s learning. · Design for the diverse needs of the adult audience, including participatory activity, quiet observation, and socializing with other adults. · Offer expert perspectives on informal science learning through partnerships with researchers and teachers in training. Such as they do at MOS and BCM. · Offer opportunities for adults to create documentation projects that facilitate children’s reflection on their own activity. · Provide ideas for how adults might continue the inquiry and projects started in the Museum at home, and support visitors’ efforts to implement these suggestions through web-based, newsletter, and other resources. This last point takes me to the off-site long-term relationship piece. One tenet of museum education is that a visit will continue to resonate in people’s lives long after they leave. Being a place to go when museum users have follow-up questions or comments is a piece of the way museums can extend their work beyond the walls of the building. This support also allows adults to articulate and reflect on the connections they make between their lives and their Museum visit. Following are some ideas that are tuned to adults - easy to access, relevant, and helpful, fun, playful and participatory. So bridging this need with the right set of materials is a win-win. Set up an email newsletter with a monthly Hot Tip that goes to visitors’ email, is displayed on the museum's home page, and is also included in the “hold” soundtrack on the phone. Create a screen saver that people can download at home featuring images from around the Museum. Create an interactive timeline that encourages adults and children to talk about events in their lives and to compare where they were and how they felt at those moments. The timeline might be seeded with some starter ideas that span the generations and include both large global events as well as local, personal experiences. Imagine The Mint Museum interactive site framed this way. What has your museum tried? Normally I would post a video like this one on our facebook page rather than into the blog but there is something so charming about this that I wanted to share it here as well. One of the issues for anyone working with children is being able to understand how they understand the world around them. It goes without saying that kids don't have the same perspective - much less the cognitive framework and technical knowledge - as adults. But it can be hard to hold the context in our own minds of what a child really means when they say or do a particular thing. Emily Beckstrom, who does museum evaluation and who worked on the Standards of Excellence project as a graduate student at the Erikson Institute, once told me about a "continuum of questioning" which puts that phase of the constant "why?" in a broader context of children's wondering and testing of the world and of our explanations. It was an important insight to see how kids' ability to formulate questions changes together with their persistence in finding answers, and their willingness to insist that adults help them. As a museum professional this video also fosters a sense of appreciation and awe for the process of growing. Each moment in this video is a reminder of the constant change, development, and increasing competence of children. Something that I think we need to hold in our minds as educators, social service workers, and mentors - all roles we take on daily in our field. This tension between remembering what the naif world view of children really is like and celebrating their achievements and capacities is at the heart of the experience we strive for in designing for families. In thinking about interesting current happenings in museums here in the U.K., I noticed I was reading about museums using innovative social media and the internet to inspire participation and extend the museum experience. In particular an exhibition at the Cuming Museum in South London appealed to me as someone who loves shoes. The Cuming Museum is currently hosting an exhibition called “Stories of the World: Walking in my Shoes,” funded by the Cultural Olympiad project. The exhibition features shoes from around the world and the journeys we make in them. It features designs by area young people alongside displays of historic shoes from the Museum’s collection. The exhibition is augmented by a program in which young people in the Southwark neighborhood have been asked to send in photos of their own shoes and describe their everyday journeys. Also, the Museum is building up a map of the area, based on favorite places, routes, and methods of travel as well as favorite footwear. Visitors are invited to post photos of their favorite shoes to the exhibition’s Flickr group. In reading this description, I assumed that the journeys submitted and mapped would be done digitally and posted on the web, which I found quite interesting and was curious to see how museum visitors mapped a neighborhood. I searched around on-line, but was unable to find any maps in conjunction with the exhibition. Since I had never been to the Cuming Museum, I decided to go there in person to check it out and gather more information. The Cuming Museum is a small Museum located within the Old Walworth Town Hall. It features the collections of the Cuming family, who collected almost anything for over 100 years. In addition to their interesting and pleasantly jumbled collections (ranging from ethnographic and natural history objects - the collection includes both real and fake items), the Museum presents the history of the Southwark neighborhood all the way back to Roman times. The Museum’s permanent galleries show that great care has been taken to involve the current community, which includes many immigrants and houses people from all over the world. While the galleries were unstaffed, there were many opportunities for interaction with real objects, exploration sheets to pick up and fill out, areas for visitors to leave personal comments, and items you could make within the galleries. The Shoes exhibition was located in the one room temporary exhibition hall. The exhibition simple and well executed. One wall contained a display of shoes designed by neighborhood young people along with explanations about why they created their designs. 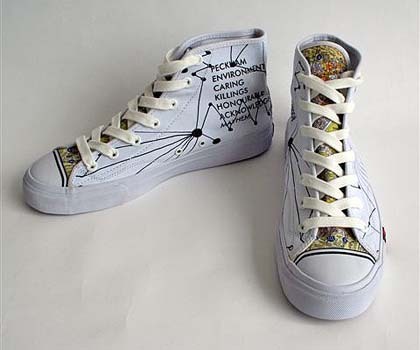 The artists were identified by their shoes (not the ones they created but the ones they wear) and it appeared to me that the shoes they did create were done through Converse. If you are inspired, you can design your own shoes through the Converse website. There were ample opportunities to participate by trying on shoes, contributing a graffiti map of how you came to the Museum that day, and of course, interesting displays from the Cuming shoe collection. The exhibition design was comprehensive and the exhibit furniture was all created out of stiff cardboard. A lovely and enjoyable exhibition, even if I wasn’t able to access people’s favorite neighborhood places and trips from the comfort of my home computer. Many museums have a goal of serving as a meaningful resource for their communities. For the past few years we have been using the phrase "to follow the visitor home" as a way of describing the opportunity for museums to use digital tools to create ongoing relationships with visitors in service of this objective. And there have been a handful of interesting experiments with the idea of digital portfolio creation, visitor tracking, and customization strategies that we have been paying close attention to. The key in my mind is not just using the web as a community platform - although if that were my criteria the Brooklyn Museum takes the cake - but linking the on-site and off-site experience of stakeholders through a multi-touch relationship in which the museum is positioned as a hub in day-to-day life. Its a pretty big idea and some people might argue that if the visitor center is no longer the main event why is it still a museum? But I think we have been using the word "museum" for years to refer to organizations that are essentially community-based, social service, out of school time learning institutions and in which exhibits serve as one means - but not the only means - to deliver on the mission. And the projects I'm talking about do have a necessary physical dimension, but they move beyond that to encourage revisiting and reflection, and ultimately (hopefully) repeat visitation. The Darwin Center has a barcode system that lets you "collect" topics that you want to follow up on later from home. The concept is after you visit you can go on line and you have a ready-made field notebook that is continuous with the exhibit. This is the paper card with a barcode on the back that visitors pick up from displays throughout the exhibit. Barcode scanning stations are integrated into tables and displays and are intuitive to use. The media interactives use touchscreens and motion sensor technology, turning them into whole body interactives. Many of the interactives have screens such as this where you can "collect" topics or items to save to your barcode. Pros: The exhibit is very linear and almost all technology. On a busy day it is necessary to keep people moving down the ramp but each of the media interactives is both beautiful and content-rich meaning that people tend to get deeply involved. The barcode system at least suggests that you don't have to do everything in the exhibit since it is also on-line. Also, because it is information rich I wanted another chance to come back fresh and ready to absorb more at a later date. It was just too much detail for me to really get the first time around. This feels like an ideal scenario for on-line follow up, and the barcode system means each visitor can customize their web experience. The website itself goes farther than the exhibit and allows visitors to connect with other affinity groups, join an extended conversation, and move from simple curiosity into sustained interest. In this way the website deepens the impact of the exhibit and improves the outcomes for changing attitudes and behaviors around sustainability, stewardship and personal responsibility. Cons: The execution of the on-line site is much more complicated than the exhibit. It is organized completely differently. When I logged on I had to set up my user profile before I could find my saved links. And even after almost an hour on line I still couldn't find my way to the items I had "collected" in the exhibit. The design of the exhibit is not mirrored on the website which makes it hard - for me nearly impossible after a month - to reconstruct what I had been thinking about during my visit. Skyline at CCM (which we designed) has a set of Story Stations where a camera takes automatic snapshots of visitors as they construct a building. After finishing their structure visitors are invited to select images to create a digital book of their work and to narrate it. They can take their Building Permit home and enter a unique code into the museum's website to download their story. Rick Garmon, at CCM, says that almost 30% of visitors follow through and that the Museum is looking at additional opportunities to use this documentation and reflection strategy in the museum. This is the graphic explaining the story station process to visitors. A dad and his son make their building. This family is selecting images and recording their story after completing a building. An example of the story station instruction screen. The story stations prompt both children and adults to reflect on the activity and create a joint narrative. Pros: This experience is self-contained. That is, it uses digital media to capture a start-to-finish building project. That makes it easy to use. The follow up in the exhibit of sorting the photos, selecting the best ones, and narrating a short story about the project also reinforces the experience, personalizing the digital book. I believe that these qualities of being concrete, immediate, and custom all contribute to making the media component meaningful and relevant. These decisions were worked through in prototyping and front-end evaluation, and are rooted in a child development approach. One of the other really successful aspects of this component is its ability to engage adults with their children. The media component calls attention to children's cognitive processes during play, and reminds adults of the thoughtfulness and work that drives children's play and from which they learn essential skills and knowledge. Cons: Making the digital book is a one-off opportunity - visitors cannot continue to play with or manipulate their book after it is completed. The on-line experience is limited to printing or downloading the file. It would be great if there were ways to continue to work on the story - adding music or sfx, recording new audio and editing it, adding drawings or even creating animations from the snapshots. There is also no dialogue back to the Museum from home. Where the Darwin Center has used the website to create an on-line community, this project is limited to pushing content from the Museum to the home and doesn't open up new networks for dialogue. That may be an audience issue in part - CCM is for early childhood - but it is an interesting opportunity especially for kids on the upper edge of the target age group who do play on-line community games. Artquest is a maker gallery at the Frist. I haven't been but everyone I know who has loves it. I spoke with Anne Henderson, Director of Education at the Frist about the gallery and their Project Access website. In Artquest visitors can make their own art. After they complete a project, visitors can use photo stations to take digital pictures of their work. They can also have their photo taken and get their own personalized card which gives them access to their digital photos on-line. Visitors can save as many images as they want and all they need to do is bring the card with them to add new work to their on-line portfolio. There is a simple on-line interface that allows visitors to continue to work on their projects (now digitally) or narrate them, share them, and update their community profile. The website itself was created by Little Planet Learning and was funded as part of an IMLS grant for working with adult ELL. Pros: The website serves as another "gallery" for the museum with a set of digital activities including managing your own portfolio, quizzes, lesson plans, and more. Once in your own portfolio users can create a narrative for their artwork. There are also areas where an entire class can share their work. There is no fee because the Frist is free to 18 and younger, and because the site was originally conceived for ELL the vocabulary is accessible for all ages. The project is easy to maintain because it was built for low end computers (using low resolution graphics etc). And the number of users has shown that it is a successful example of how to use technology to sustain a relationship with museum. Cons: There are some drawbacks to this project. For one, it only handles flat art and can't do animation. That is really only a problem if the Frist wants to put animation stations in Artquest, but because of how easy it is to animate online it would be nice to have the option to create animated shorts and add them to the portfolio. There is also limited opportunity to interact with other website users, or with the Museum itself - wouldn't it be great to be able to favorite other on-line works, and have the most favorited works displayed as digital art IN the Museum? Because new images have to be uploaded at the Museum (the database is hosted by the Museum and the card scanners live on the staff desk in Artquest) the website supports repeat visitation to the Museum. But if someone made an artwork at home they could not add it to their portfolio unless they brought it in. Anne told me the change she would make, if they were designing the project today, would be not to do physical cards for people to carry because they are too easy to leave behind or lose. Instead they would look at alternative technology solutions to creating log-ins. We'd love to hear if you have had personal experience with any of these or other examples of projects that link museum exhibits to the web in an iterative experience. What works? What doesn't? And can the internet be ultimately another "exhibit platform" for museums?